Our Centerpointe for Children occupational therapists are a close knit bunch! What you may not know is that each therapist has her own private practice! You will surely see all of us around the clinic, so make sure to say Hello! Suzanne Greenwood graduated with a Bachelor of Science degree from the University of Southern California. A pediatric occupational therapist since 1999 and in private practice since 2003, Suzanne established Centerpointe for Children with ambitions of providing a multi-disciplinary center focused on both child and family. In her practice, Suzanne has supported children and young adults ages 9 months – 26 years of varying diagnoses across clinic, home, school, and community environments. Suzanne is SIPT (Sensory Integration and Praxis Tests) certified and has completed the fidelity training in Ayres Sensory Integration®. She has extensive experience in relational, play based therapy, social-emotional vulnerabilities, and has been trained and mentored in supporting children using pointing and type-based communication methods. Suzanne provides evaluation, treatment, consultation and collaborative services for children and families, personal support staff, academic staff, and therapeutic professionals. Suzanne’s simple joy is stand up paddling with her dog, Greta. When not in flip-fops around town or crazy socks at the office, Suzanne has her running shoes on and anticipating her next “adventure”! Angie Winslow received her Bachelor of Arts degree from Walla Walla College with a major in Spanish in 1998. She went on to study at the University of Southern California and received a Master of Arts degree in Occupational Therapy in 2000. Angie focused the first six years of her clinical practice on the treatment of children with Autism Spectrum Disorders, specifically through program development and as the ongoing treating clinician for a multidisciplinary early intervention program. Through this work she has enjoyed the privilege of collaborating with several world renowned clinicians and physicians. She is SIPT (Sensory Integration and Praxis Tests) certified and has completed the fidelity training in Ayres Sensory Integration. Angie enjoys evaluation, treatment and multidisciplinary collaboration in order to better serve children with a variety of diagnoses in the clinic, school, home and communitY. Angie loves to play! Always on the go with her two little boys, whether it’s a bike ride, family surf trip, or training for a race, she is sure to be outside and moving. Susanne is an occupational therapist with over 30 years of experience in pediatrics. She obtained her BS in OT at Indiana University, her MS in Allied Health Sciences at Boston University and her OTD at University of Southern California. Susanne is in private practice in Orange County in Southern California and co-founder of the nonprofit, Collaborative for Leadership in Sensory Integration (CLASI). She is a past chair of the Commission on Practice and the Sensory Integration Special Interest Section for AOTA; and a contributing author of the Occupational Therapy Practice Framework: Domain and Process, 2002 and 2nd Edition. She is an internationally recognized author and lecturer on the theory and application of sensory integration. She is co-editor of the books, Understanding the Nature of Sensory Integration with Diverse Populations and Sensory Integration: Applying Clinical Reasoning to Diverse Populations. She is a fellow of the AOTA and recipient of the AOTF Virginia Scardina Award of Excellence and the AOTF A. Jean Ayres Award. Aparna Guttery received a Bachelor of Science degree and a Master of Arts degree in Occupational Therapy from the University of Southern California. Since 2002, Aparna has worked as a pediatric occupational therapist serving children of all ages and with a variety of diagnoses in the clinic, home, school, and community based settings. She specializes in using Sensory Integration and motor learning techniques to facilitate gross and fine motor development, as well as facilitate play skills, and promote independence with activities of daily living. Aparna also has extensive experience working as part of a multi-disciplinary team to design and implement group based programs to support social and play development. More recently, Aparna has pursued a passion project. By combining research and years of clinical experience, she has developed a functional and effective therapeutic tool to allow children access to soothing comfort on the go. RelaxPack is a patent-pending Sensory Backpack designed with unique and effective sensory features to allow children to experience a variety of calming sensations. It was designed to help children self-regulate and maintain optimal energy states at school, in the community, or anywhere they would benefit from extra comfort. For more information, please check out her website at https://therelaxpack.com/. Michelle Currey received a Bachelor of Arts in Human Development from the University of California, San Diego. She earned a Master of Arts in Occupational Therapy from the University of Southern California in 2000. 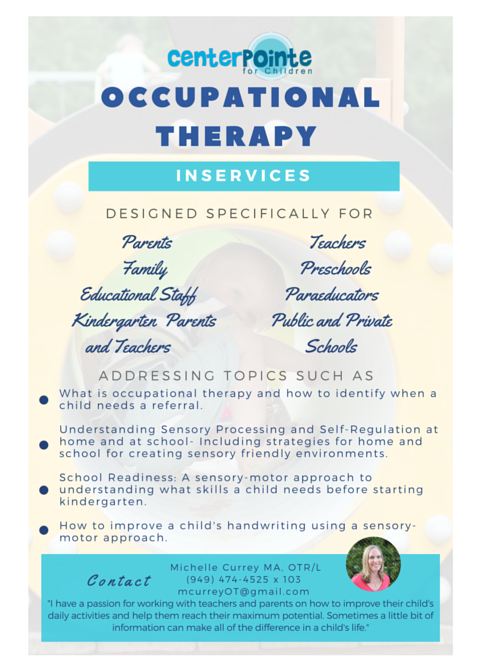 With a lifetime interest and love for working with children, Michelle has worked as a pediatric occupational therapist and occupational therapy supervisor since graduation. Her passion for mentoring other therapists and teaching also led her to teach at the university level, as well as provide a variety of in-services for schools, educational staff, parents, and colleagues. Michelle has worked with children ranging from the ages of 2 to 16, with a variety of diagnoses, providing evaluation, treatment, and consultation in the clinic, home, school, and community based settings. She is SIPT (Sensory Integration and Praxis Tests) Certified, using the foundational practices of the sensory integration frame of reference combined with sensory-motor techniques in order to enhance the motor development, daily living skills, play skills, social skills, academic skills, and self-help skills of her clients. Michelle loves to be active and outdoors. Play sessions with her family include walks to the beach park, beach days with a possible surf session and swimming, movie nights in the backyard, and get-togethers with family and friends. Michelle also loves independent films, watching live music, playing the guitar, and traveling (especially to warm, tropical locations). Aja Roley is a board certified and licensed Occupational Therapist. She received her Masters of Sciences in Occupational Therapy from the University of Southern California in 2012. She specializes in the treatment of children with a variety of disorders including autism spectrum disorder, developmental delay, attention deficit disorder, sensory modulation disorder, and dysfunction of sensory integration. She has received advanced practice education in Ayres Sensory Integration® and is certified in the administration and interpretation of the Sensory Integration and Praxis Tests. Her ultimate goal as an occupational therapist is to work in collaboration with both children and their families to promote optimal skill development that can translate into success in school, home, and community settings. Aja enjoys practicing yoga, swimming, hiking, and camping. She also loves learning new styles and methods of dance. A favorite pastime is cooking meals for her family and friends. Korrie Sparks is a board certified occupational therapist dedicated to supporting and enriching the lives of the children she treats. She received her Doctorate of Occupational Therapy from the University of Southern California in 2013. Korrie is certified to administer and interpret the SIPT (Sensory Integration and Praxis Tests) and has specialized in the treatment of sensory processing and social-emotional disorders. Combining these two specialties, her doctoral thesis explored the use of evidence-based mindfulness practices within elementary schools. It is her strong belief that foundational skills gained from therapy at a young age can support participation at school, at home, and within the community across the lifespan. Korrie loves being outside in nature! Hiking, running at the beach, and practicing yoga are some of her favorite activities. She enjoys spending time with her rambunctious Italian family and exploring the world through travel! 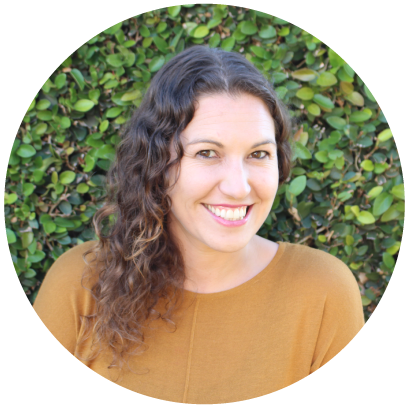 Shortly after graduating from the University of Southern California (USC) with a Bachelors and Masters degrees in Occupational Therapy, Avital began her work as a Pediatric OT and has been working with children since 2008 in school base and private clinic settings. Avital is the creator of OTPlan, an activity idea search engine for developmental activities. She has experience serving children with a variety of diagnosis in the clinic, home, school, and community based settings. She specializes in using task analysis to develop goals and plans that support the child’s needs. She believes in helping parents to focus on strength and abilities of each child while incorporating behavior plans and strategies to foster success.